Some festival lineups are just insane. 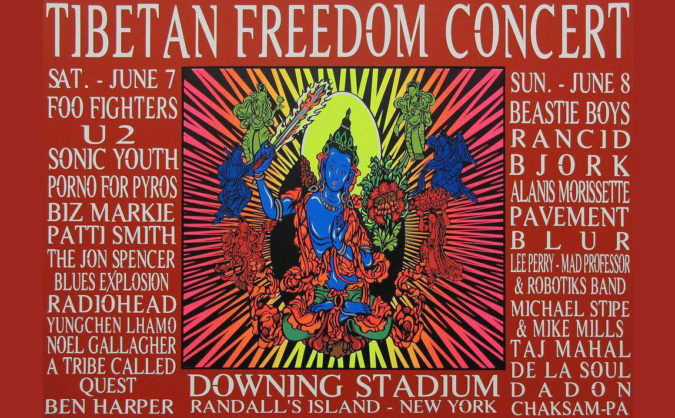 New York City’s Tibetan Freedom Concert (which took place on June 7 & 8, 1997) included some of the major music acts of the last half century, including Radiohead, U2, Foo Fighters, Alanis Morrissette, Blur, and Beastie Boys. Radiohead had released OK Computer on May 21 – less than a month prior to the concert. I was a teenager at the time, and I snuck out of my house to go to New York for the weekend with friends. The show was unforgettable. The Tibetan Freedom Concerts were originally organized by the Beastie Boys and the Milarepa Fund. In addition to the New York City event, concerts were held in San Francisco, Washington D.C., and at multiple international venues. The New York City concert was held at Downing Stadium on Randall’s Island. The event raised over $250,000 for Tibetan independence. The Beastie Boys had taken a major interest in Tibetan independence; Adam Yauch was a cofounder of the Milarepa Fund as well as a practitioner of Buddhism and nonviolence.